The strangest part of my own case was the fact that anyone who has ever attempted to go after Goldman Sachs & crew of Investment Bankers, has strangely encountered the heavy hand of government that is used to protect them resulting in the New Your Investment Bankers being called the UNTOUCHABLES. In my own case, I kept track of all the countless market manipulations that the Untouchables were orchestrating. There were a number of us around the world who monitored what they were doing just to ensure we did not get caught up in their manipulations. Every phone call was recorded to ensure that if I was ever sued in what I thought was an honest court, I could prove my sources. Every manipulation they did from rhodium to platinum to interest rates, Russia and politicians were always documented. The wealth of investigative material in an honest world would have brought down the New York Investment bankers and sent them away to prison for life if not wound them on the gallows for treason. All of this material was not gathered with any idea of using it against them – but to be able to advise clients what they were up to next. 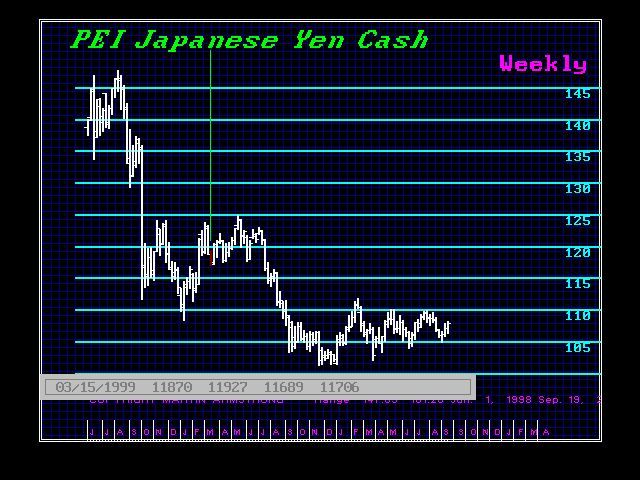 At our March 1999 Tokyo Conference, we warned publicly that the “club” was then targeting the Japanese yen for the seasonal rollover. We advised our Japanese client to lock in their trade to defeat that manipulation. They did and the yen moved from the 116 level up to 124 causing massive losses to the “club”. Here is our slide presentation for that Conference in Tokyo. When my case began, the SEC requested Alan Cohen to be the receiver who just so happened to be their hand picked judge’s Richard Owen’s former law clerk. The head of the SEC Enforcement Andrew J. Geist was the one requesting Alan Cohen of O’Melveny & Myers, a California Lawfirm, to be their receiver. 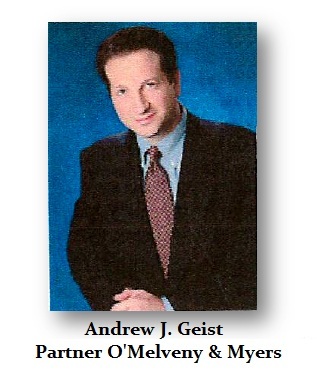 Geist then left the SEC and became a partner in the very firm he selected, which was totally illegal as previously ruled by the Second Circuit. But government never prosecute their own. 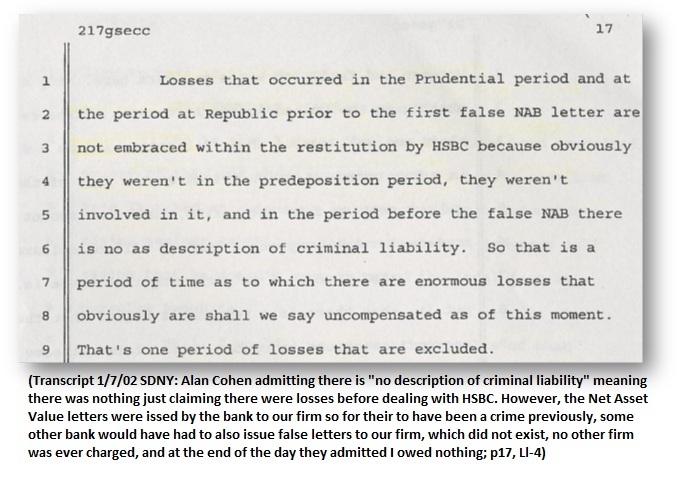 It then came out early on that Alan Cohen GS somehow found out I had given audio tapes covering the organized trading of the “club” manipulating markets and threatened my lawyers if they did not produce all the tapes, they were to be thrown in prison. Everyone I had spoke to about the manipulations on an ongoing basis had been documented. 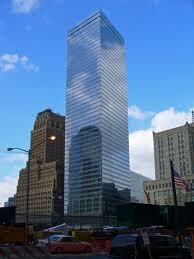 That would have been enough to shut down the New York Investment Bank manipulations. Phone calls with numerous dealing desks around the world documented every manipulation and scam they had pulled off from bribing government official to targeting countries. It was not my intent to run to the authorities and say here is the evidence to shut down the bankers. This was to purely advise clients when the duck. The recent results of the LIBOR Manipulation Scandal demonstrates they continue to this day to manipulate whatever they can to get that perfect guaranteed trade. They do not want to risk money – they want to ensure they make money. This latest scandal is no different than the Salomon Brother US Treasury Manipulation Scandal for why stop when they own government today and pay a small fine whenever they get caught in the public eye. So there was no intent on my part to get involved in such a system nor to expose it publicly. My job was to protect clients. Nevertheless, extracting all my investigative materials became Alan Cohen‘s target threatening to imprison my lawyers if they refused to turnover that evidence. The US Department of Justice obviously consented to the action and never made one step to defend the free markets. The trick to discredit such evidence is to always attack the messenger. That they did to distract everyone from the core issue – market manipulation by the NY Investment Banks on Wall Street that has continued to go on. It has been this trend that has blown up the entire world resulting in higher taxes and the loss of all our liberty all because of these people trying to rig the game for the perfect trade. Now we face “bail-ins” where deposits will be confiscated to cover losses when these people lose on their next failed guaranteed trade. 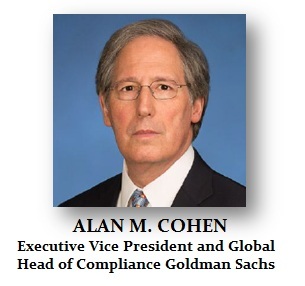 It certainly appears highly suspicious to everyone that Alan Cohen of GS would then be appointed a board member of Goldman Sachs head of Global Compliance when Goldman would NEVER had hired someone from the outside who clearly did not even understand markets. Alan Cohen of GS liquidated the open yen positions we had in our accounts assuming they were speculation when they were a hedge. He lost I believe $100 million in short order. How could Goldman hire someone who did not even know the difference between a hedge and a speculative trade. We issued notes in yen, converted proceeds to dollars, and had to repay in yen, which is why we had long yen positions. We were short yen and the positions were the hedge. Bloomberg News knew intimately what took place. 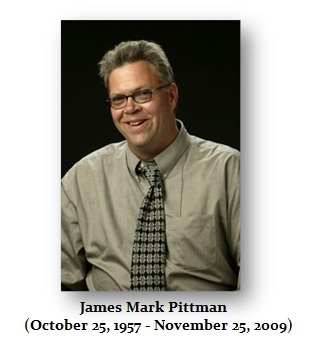 Mark Pittman was one of the few REAL investigative reporters. He investigated our business in Japan before anything happened and knew we bought the distressed portfolios, and never managed money for the Japanese. The Japanese were bleeding out of their eye sockets. If you had the best track record in the world by a factor of 10 it did not matter. They had no cash to invest. They had tons of assets that were worth 40-60% less than what they paid. When this case began, Mark knew the allegations were false. He knew the notes were issued to buy portfolios. Mark said to me – “Don’t worry Marty. We will not them them to this to you.” Mark knew I had been collecting data on all the manipulations, not to be used per se in a criminal case, just to be able to advise clients what markets to be careful about. How can I advise client a market is breaking out, they buy the high, it collapses and I make up the excuse it was manipulated by the bankers. Major institutions expected me to know what was going on. That was part of the job. Bloomberg News removed Mark from covering my case. In doing so, Bloomberg protected the banks and made sure the very evidence that would have exposed the truth about the banks.Bloomberg removed Mark who had gone after the Fed. Mark was a dying breed of REAL investigative journalists – very few and far between. That is why we respected each other. He knew I was out of the NY crowd and respected that view and why. Bloomberg replaced Mark appointing David Glovin who would NEVER even once print what my response was to anything. Glovin only printed the government allegations – so much for Bloomberg News reporting the truth – provided it did not offend Bloomberg himself, clients, and the government. What can you expect when Bloomberg himself was a top guy at Salomon Brothers who got caught manipulating the US Treasury Auctions. Yet the press refuses to link the dots. They treat every manipulation as isolated and move on to the next. They started with the first manipulation by Salomon Brothers of the US Treasury Auctions. They overlooked the seizure of the US Treasury position by Robert Rubin of Goldman Sachs and the repeal of Glass-Steagall that made the current crisis possible unchaining the banks and letting them run wild. Countless commodities have been manipulated and then there is the current LIBOR Manipulation Scandal just like the original Salomon Brother US Treasury Manipulation Scandal. They pay their fines, which are always a tiny fraction of what they make, and move on to the next. The press NEVER says – hey! Are these fines just pay-offs? So the New York Press will NEVER report the truth about the courts, the banks, or what Alan Cohen of GS did no less the fact that all the evidence we gathered that would have put all the bankers in prison for life, magically disappeared in the collapse of the SEC Building World Trade Cent 7 that amazingly was not even hit by an plane in the 911 attack. This has been yet another part of the amazing coincidence behind everything in this case. Our computers and all the evidence in our case, including the evidence gathered documenting more than a decade of organized manipulations were amazingly destroyed in the only building that was never hit by anything nor was there any major fire. This in itself has led to countless suspicions about what really went on behind the collapse of the SEC offices in World Trade Center 7. 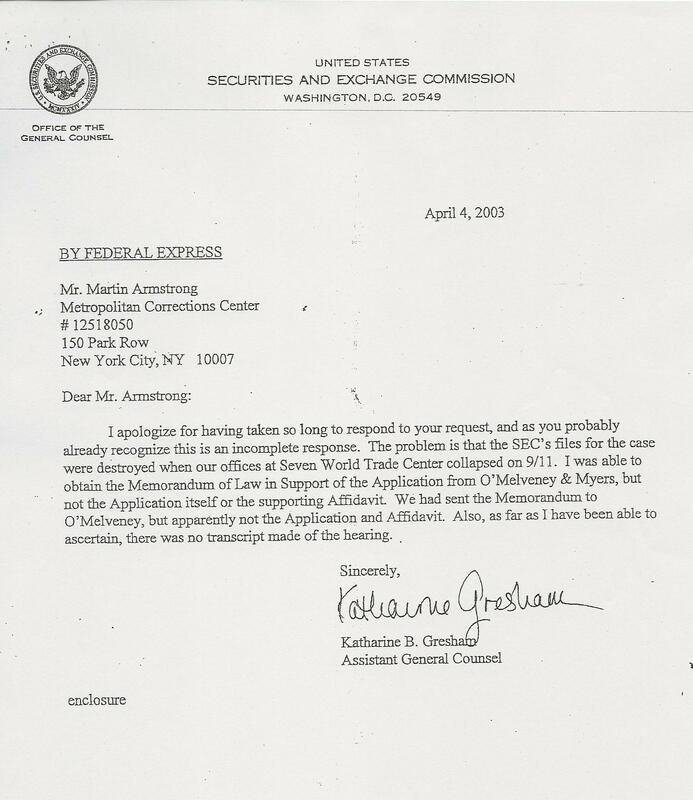 Here is a video on this strange set of circumstances plus a letter from the SEC claiming all evidence in my case was destroyed, which many believe was a convenient way to protect the New York Investment Bankers. The real question become how many coincidences does it take to make a bonifide conspiracy? 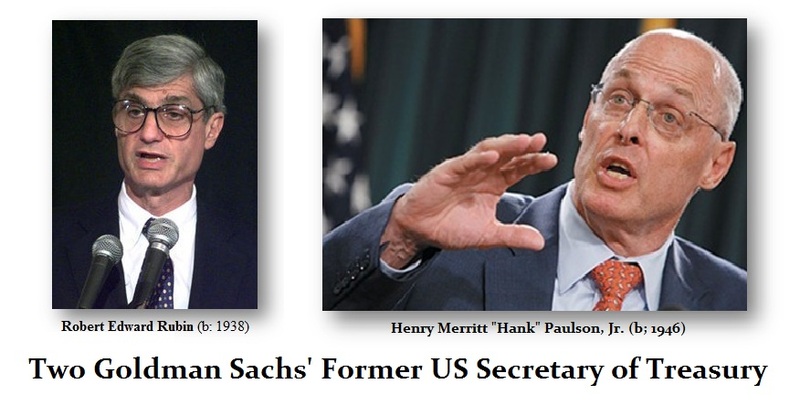 Goldman Sachs installed two of its former heads as US Trasury Secretaries with the first removing Glass-Steagall and the second getting the $700 billion bailout for the banks while removing the major competitors to Goldman Sachs – Lehman Brothers who was a hated rival and Bear Stearns who refused to participate in the bailout of Long-Term Capital Management because they were NOT part of the “club”. 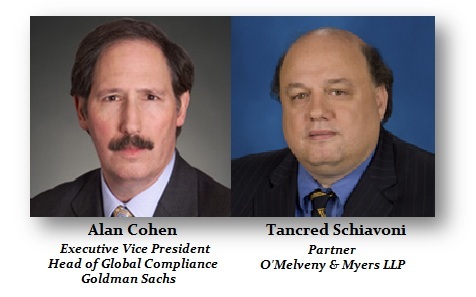 This is precisely what Alan Cohen of GS after taking the Board Position at Goldman Sachs refused to disqualify himself and remained as the receiver over Princeton Economics to prevent anyone else from (1) getting rid of O’Melveny & Myers and (2) would have reviewed what was done by Cohen and Tancred Schiavoni. Any new receiver would have had a legal obligation to go after Cohen. When Martin Weiss stepped forward and wanted to “rent” Princeton Economics to keep the forecasting going, Tancred Schiavoni wrote to his lawyer demanding I turnover the computer model source code. My refusal would result in the firing of all employees and the closing of Princeton Economics. I had no choice but to refuse to produce the model. If I was supposed to be in contempt of court to turnover assets in case I had to compensate victims, the pretense of this facade fell apart after Republic National Bank and Hong Kong Shanghai Bank pleaded guilty and of course nobody went to jail as long as they simply returned what they stole in 2002. So how was it possible to keep me in prison to turnover assets when all “victims” were made whole by the banks? Alan Cohen personally told the court that I should never be released even tough there was NO DESCRIPTION of any crime outstanding. I was now being just arbitrarily held without anything at all. So yes, Alan Cohen of GS was intimately involved to prevent my release and advocated holding me until I died even though there was no crime, no description of a crime, no trial, not entitlement to lawyers, or anything that was supposed to be American. Under Due Process of Law you are supposed to be advised what you are being accused of and you then enter your plea guilty or not guilty. I was NEVER advised of any such crime and this is what Alan Cohen of GS stood before the New York court loaded with the “free” press who NEVER would report a single word or bothered to question anything Goldman Sachs every does. Welcome to America – the land of countless conflicts of interest and millions of laws that can be used to shut people up pretending they are enforcing that law to achieve your silence. Wiki Leaks they want to imprison for life to leaking the truth about THEIR illegal activity. Americans are entitled to a “PUBLIC TRIAL” where everything is supposed to be open to the public for review. That does not do much when the press is pro-government and they close the courtroom illegally and throw the Press out as Judge Richard Owen did on April 24th, 2000. That event caused the Associated Press to report that it was a “closed” hearing and to question whether I would ever receive a “fair trial” in New York City. What Alan Cohen of GS did that from confiscating all evidence to protect the New York Investment Bankers, arguing I be imprisoned forever even though there was no longer any crime even described, to advocating throwing out the press on April 24th, 2000, one can only wonder just what is going on in New York City. Because they could not even describe a crime I might have done, Alan Cohen of GS dispensed with the problem of even charging someone and providing notice to defend. His solution, just imprison me until I died knowing the NY Press will NEVER go against the NY boys. So much for liberty and justice for all and the land of the free except when you expose the New York Bankers and their destruction of the free markets and world economy. It is always about shutting people up to protect their illegal activities. The most insane corruption in New York is the acknowledged alteration to the transcripts that the judges in New York Federal Court claim the power to change the very words you speak in court. The Second Circuit Court of Appeals acknowledged the practice as being “unique” to New York, but on page 97 of their decision in UNITED STATES v. ZICHETTELLO, they claimed they lacked the power to order judges to obey the law.